You are warmly invited to the launch of Monsters of Virtue by L.J.Richie. Please let us know if you would like to attend via our Facebook event page. New Zealand, 1932. The height of the Great Depression. In the wilds of the Ōtaki River Gorge, the newly formed Eugenics Department gathers the best and brightest in an attempt to create perfection. … But what makes a perfect person? Fifteen-year-old Eve knows she’s not one – but with her sister’s life on the line, she’d better onvince her new classmates that she could be. Together with uneasy allies Orion and Nyx, she’ll pry into the dark heart of this fledgling utopia. Will the future that awaits them there be one worth fighting for? 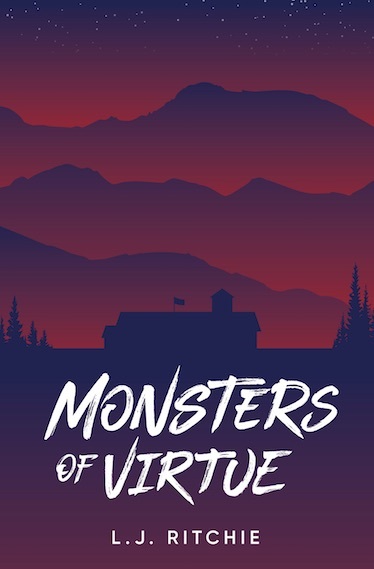 Monsters of Virtue will appeal to fans of thought-provoking, action-filled YA fiction like The Hunger Games and Lord of the Flies, as well as readers who want to explore the darker side of New Zealand’s past. L.J. Ritchie is a Wellington-based author of young adult fiction. His previous jobs include secondary school performance arts co-ordinator, lighting and sound technician, garden labourer, web designer, domestic cleaner, data-entry operator, and publicist for an Elvis impersonator. One perk of becoming a writer is that what was once a motley curriculum vitae can now be called professional development. He completed the Whitireia Creative Writing Programme in 2013. His debut novel, Like Nobody’s Watching, was a finalist in the Young Adult Fiction and Best First Book categories at the 2017 New Zealand Book Awards for Children & Young Adults.